When you’re looking at the output of Test-SPContentDatabase you should start at the top, because fixing issues there will oftentimes fix issues downstream. The first two reported issues refer to missing Features. Although SharePoint 2013 can’t tell you the name of the missing Feature, it does provide the Feature’s ID and its description to help you figure it out. In this case, the Feature is referenced in the database, but the files for the Feature do not exist on the SharePoint 2013 farm being tested against. Depending on what the Feature does, that may or may not be a big deal. While the message indicates what the Feature is, it doesn’t indicate where it is referenced. That will help you figure out what needs to be installed, or determine if the web or site referencing the Feature can be deleted. Test-SPContentDatabase has an optional parameter, -ShowLocation, which provides the GUID of the web or site collection that references the Feature. You can take that information back to the farm from which the database came to find the Feature reference. Note that on large databases, the -ShowLocation parameter may significantly increase the amount of time Test-SPContentDatabase takes to run. After you’ve either installed the missing Feature or deleted the web or site collection that references it, run Test-SPContentDatabase again. In this case, installing the ShortURL Feature will clean up the MissingFeature issues, as well as the MissingSetupFile and MissingAssembly issues later in the output. If you can’t figure out which Feature is missing, or aren’t able to install it into your SharePoint 2013 farm for whatever reason, don’t worry, all is not lost. 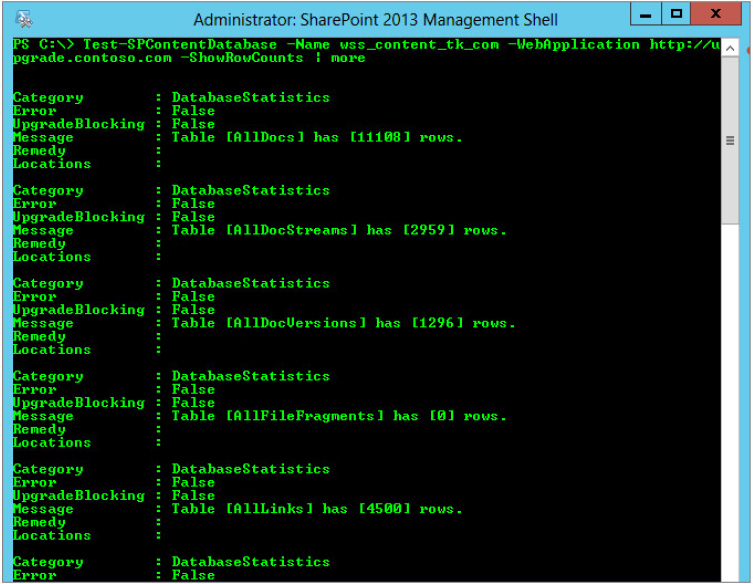 While SharePoint is unhappy about these issues, it’s not terribly concerned. Notice that each issue has an UpgradeBlocking property. This is SharePoint’s way of waving the white flag and admitting that it can’t handle the issue it found. In the case of the two issues reported here, neither of them has UpgradeBlocking set to true. Therefore, although SharePoint has found a problem, it’s not anything it can’t handle, so you can go ahead and attach the database. Again, depending on what the missing Feature did, the content in the database may or may not render correctly. As you’re fixing issues, keep your eye on the UpgradeBlocking property. It says it will not be able attach the site located at /. This is because the Upgrade web app already has a site collection in its root. This is the site collection used to verify that DNS and everything is working correctly. Because that site collection is no longer needed, you can either delete the site collection or detach the content database that was created along with the web application. The issue is in the category MissingSetupFile. In this case the setup file is part of the ShortURL Feature mentioned in the first issue. This is why you start at the top. If all the MissingFeature issues are addressed and you still have MissingSetupFile issues, then you can troubleshoot them individually. Figure 2 indicates some issues that are not part of the missing Feature. Instead, they were caused by customizations that were made to a blog in one of the site collections. Clever readers may have already figured out that the database in the figures is from http://www.toddklindt.com. It’s had a few bad things done to it. The blog MissingSetupFile issues are probably related to those bad things. The next two issues in Figure 3 have the category LegacyUIDetected. This database was originally created in SharePoint 2007, and not all of the webs have been visually upgraded to the SharePoint 2010 interface. Like the Remedy section says, the recommended approach is to go back to your SharePoint 2010 farm and switch the UI to the SharePoint 2010 mode and make sure everything works. Then attach it to your SharePoint 2013 farm. If you don’t do that, all the webs will be automatically changed to the SharePoint 2010 UI. While that will probably be fine, it’s better to control that change yourself. The next issue refers to a missing assembly, which is part of the ShortURL Feature that was missing in the first issue. Again, fixing the issues from the top down can keep you from chasing your tail on little issues like missing files and assemblies. When the list of issues is so long that it scrolls through the scrollback buffer it’s tempting to start with the issues you can see. Always start at the top. You’ll save yourself time, and possibly even pull out less hair during your upgrades. The final issue that Test-SPContentDatabase found is an authentication mode issue. The database tested came from a SharePoint 2010 web application that was using classic-mode authentication, but the web application it was tested against uses Claims. Before attaching this database and upgrading site collections, there is one additional parameter of Test-SPContentDatabase to cover, ShowRowCounts. This parameter gives you the row count for each table in the content database before it reports the issues. Figure 4 shows example output. Here you can see the row counts for the first five tables in the content database. Getting this information in not necessary in most cases. It can help in scenarios where the upgrade process is taking longer than expected. It exposes issues such as an excessive number of document versions. Even if you don’t need the information, it’s interesting to see. Now that the database is tested, it’s time to attach it.